Curators: Fordham University students, with Jo Anna Isaak and Gregory Waldrop, SJ"
A panel/conversation about gun control and the Second Amendment, organized by the Fordham School of Law's Stein Scholar Program for Public Interest and held in conjunction with exhibition Palas por Pistolas/Shovels for Guns. This exhibition is generously supported by Fordham University Art Collections and a grant from the Dean of the Arts and Sciences Faculty. This exhibition participates in an ongoing project by Mexican artist Pedro Reyes, Palas por Pistolas, which converts firearms into shovels to plant trees, a modern take on the Biblical directive to convert swords into plowshares. Reyes is an artist with a strong belief in conversion and even cites among his sources of inspiration St. Ignatius Loyola, the founder of the Jesuits, who likewise influenced Joseph Beuys, an acclaimed precursor of Reyes in the realm of performance, sculpture and socially engaged art. Among the conversions Reyes is effecting are the roles of the audience, the art patron, the collector, the artist, and indeed art itself. Working with local merchants, Reyes initiated a citywide gun buyback campaign, using public-service TV ads to encourage citizens to turn in guns without fear of trouble from the police. He collected 1,527 guns—40% of them in the high-power automatic category, most turned in by women. The military then disassembled the weapons and crushed the fragments with a steamroller, a “performance” captured on video. At a foundry the metal pieces were melted down and transformed into 1,527 shovelheads. 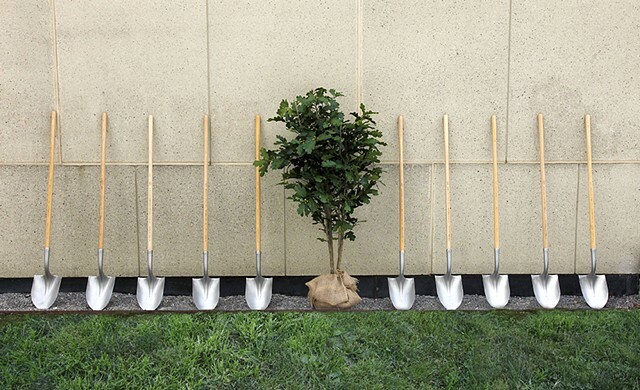 Attached to wooden handles engraved with the story of their creation, the shovels became the centerpiece of an exhibition, whose run ended with the distribution of the tools to arts institutions and schools for the planting by adults and children of 1,527 trees throughout Culiacán. A special planting invitation was extended to those with loved ones who had lost their lives because of a gun. Since then Palas por Pistolas has become a DIY kit, a kind of artwork franchise, easily adapted to various communities. Student-organized under the guidance of Fordham art history professors Jo Anna Isaak and Gregory Waldrop, S.J., Palas por Pistolas/Shovels for Guns accords with the Jesuit commitment to social justice, which includes “the protection of human rights and respect for the environment.” The hope is that it will further Reyes’ initiative to ameliorate the effects of gun violence and to engage the community in an art practice that is ad usum, useful to humans and their environments. Tree plantings will take place in April, to coincide with Earth Day.